Moxa’s new generation wireless redundancy technology allows you to set up independent wireless connections to avoid interruptions in transmission, even if interference occurs on one of the supported frequencies. The AWK-5222 is equipped with the newest proprietary wireless redundancy technology, which has two independent RF modules, and supports a greater variety of wireless configurations and applications. The redundant wireless connections increase the reliability of the entire wireless network. 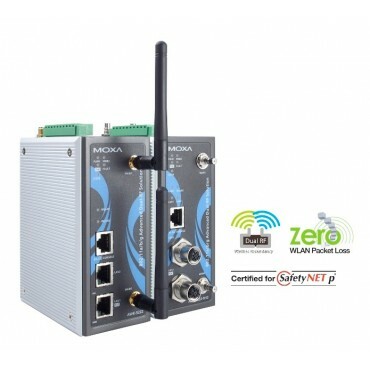 For reliability beyond wireless redundancy, Moxa’s AWK-5222 has two Ethernet ports, and supports RSTP (Rapid Spanning Tree Protocol). The AWK-5222 is rugged enough to help you establish the most robust wireless connection for critical industrial wireless applications.